This is the fourth of a four part series on “pencil and paper” binary arithmetic, which I’ve written as a supplement to my binary calculator. The first article discusses binary addition; the second article discusses binary subtraction; the third article discusses binary multiplication; this article discusses binary division. The pencil-and-paper method of binary division is the same as the pencil-and-paper method of decimal division, except that binary numerals are manipulated instead. As it turns out though, binary division is simpler. There is no need to guess and then check intermediate quotients; they are either 0 are 1, and are easy to determine by sight. This is the third of a four part series on “pencil and paper” binary arithmetic, which I’m writing as a supplement to my binary calculator. The first article discusses binary addition; the second article discusses binary subtraction; this article discusses binary multiplication. The pencil-and-paper method of binary multiplication is just like the pencil-and-paper method of decimal multiplication; the same algorithm applies, except binary numerals are manipulated instead. 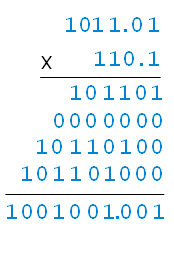 The way it works out though, binary multiplication is much simpler. The multiplier contains only 0s and 1s, so each multiplication step produces either zeros or a copy of the multiplicand. So binary multiplication is not multiplication at all — it’s just repeated binary addition! 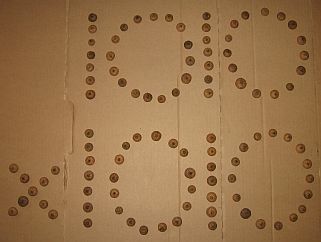 A Binary Multiplication Problem Expressed With One Hundred Acorn Tops. This is the second of a four part series on “pencil and paper” binary arithmetic, which I’m writing as a supplement to my binary calculator. 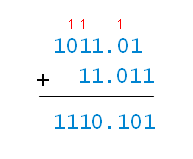 The first article discusses binary addition; this article discusses binary subtraction. This is the first of a four part series on “pencil and paper” binary arithmetic, which I’m writing as a supplement to my binary calculator. This article introduces binary arithmetic, and then discusses binary addition. Are there any multiple digit hexadecimal number palindromes that are also palindromic in binary and decimal? I have been searching but have not found any. I started my search with my program that finds multiple-base palindromes. I generated palindromes in binary, and then checked them to see if they were also palindromes in hexadecimal and decimal. I looked for decimal/binary/hexadecimal palindromes up to 16 hex digits long, but did not find any. To continue my search into bigger numbers, I wrote a program that uses arbitrary-precision integer arithmetic and a more efficient algorithm. Despite being able to search much further, I still have not found any. In this article, I’ll analyze the size of the palindrome “search space”, explain my improved algorithm, and discuss the state of my search. In my article “Counting Binary and Hexadecimal Palindromes” I derived formulas for counting binary palindromes and hexadecimal palindromes. For each type of palindrome, I derived two pairs of formulas: one pair to count n-digit palindromes, and one pair to count palindromes of n digits or less. In this article, I will derive similar formulas to count binary/hexadecimal palindromes — multi-base palindromes I’ve shown to have an algorithmically defined structure. So for example, there are 900 5-digit decimal palindromes, 9,000 8-digit decimal palindromes, 1,098 decimal palindromes of 5 digits or less, and 19,998 decimal palindromes of 8 digits or less. In this article, I will derive similar formulas to count binary and hexadecimal number palindromes.